The social-networking side of the World Wide Web has embraced the concept of World AIDS Day, by changing the colour of their homepages to red. 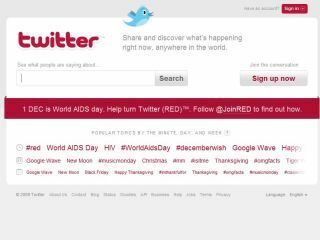 Twitter has gone all out and turned its pages red, and even Google has got into the act by adding a World AIDS Day ribbon to its search screen (US only). Facebook has gone a step further and is encouraging its members to sign up and join red, which would change their logo to a red logo. If users don't want to replace their image, then they can share a video about World AIDS Day and a direction to the red shop, where you can buy red laces to promote the charity. "At Twitter, we're making it fun and easy to spread the word about this preventable and treatable disease that is hitting Africa the hardest," notes the Twitter blog. "If you use any of the following terms below today on Twitter your tweet will turn red. Today is World AIDS day, help us spread the word."